The Americano Medio Mug is a fantastic mug designed to really show off your brand. 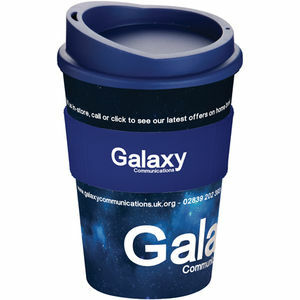 Made in Britain, this mug is incredibly versatile, allowing you to create a stunning piece of promotional drinkware that your customers will love! We offer this mug in thirteen glossy colours or you can choose the Brite-Americano Medio with a full colour print moulded into the mug itself (at extra cost). All of our Medio mugs are supplied with a silicone grip and a clip-on lid with a matt finish. The mug is BPA free, top-rack dishwasher safe, and has a 325ml capacity.